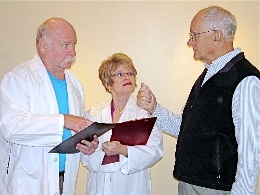 AUDIENCES for these plays included health care professionals, caregivers, and students. VENUES included health care facilities, universities, schools and colleges, conferences, professional development workshops, and in-service training programs. By Vrenia Ivonoffski and Ross E. Gray. No Big Deal is a fast-paced, touching, and often humourous exploration of the ways men and the women in their lives deal with a diagnosis of prostate cancer. By John Tench. Problems, solutions and compromises involved in the disinhibited behaviour of some older people with dementia. A one act interactive drama designed to stimulate discussion around this sensitive subject. By Susan Wilkey and Judith McDowell. Concerns related to staying safe are humorously brought to life by The Target Gang in this 40’s style radio show with songs, music, a soap opera, the comedy of Mavis and Mickey and, of course, the melodies of the Target Singers. By John Tench, follows the progress of an elderly mother from home care to institutional care. This FORUM THEATRE presentation examines a variety of interactions between familial and professional caregivers. By John Tench. A residential care where an older man is humiliated by a well-intentioned but insensitive nurse. AUDIENCES for these plays included seniors’ groups, church groups, the general public, and service organizations. VENUES included seniors’ residences, club events, church halls, and seniors’ centres. Two shy pensioners overcome their fears and find the courage to connect. Funny and charming. By John Tench. A con-man, a worried daughter, and a banker offer well-meaning advice to an elderly, overly trusting widow. A humorous cautionary tale. By Judith McDowell. A person with terminal cancer and her family, after initial disagreements and quarrels, learn to face death with a measure of control and acceptance. The concepts of representation agreement and hospice care are touched upon. FORUM THEATRE. By Jo Cannon. An overzealous daughter goes overboard in “protecting” her mother from real and imagined hazards; mother turns elsewhere for comfort! By John Tench. This play illustrates how a husband gradually comes to terms with his wife’s progressive dementia, and accepts help. By Heldor Schäfer. Stuck in an apartment elevator on their way to various destinations, five women and one man have different reactions when one among them has an “accident.” FORUM THEATRE. By Jo Cannon, demonstrates how healthy seniors can protect themselves from common injuries and stay active – very, very active! By John Tench. Three siblings resort to drawing lots to determine who of them will have to “babysit” their aging father during a long-promised token mini-vacation, when they suddenly receive an unexpected long-distance phone call from him – from a rather unexpected, exotic location! By Heldor Schäfer and the company of players of Target Theatre. An elderly woman at a golf course tries to break the news to her estranged daughter that she wants to be an organ donor when her “time comes.” A cast of diverse characters – from bag lady to hot dog vendor, golfers to bartender – have a go at the controversies and urban myths surrounding the subject. By John Tench. Three women devise a plot to lure a shy man in Millicent’s building for a tête-è-tête to her apartment, only to have their well-laid plans backfire. A light-hearted play about a mature woman’s attempts at re-entering the dating scene when she gets fed up with waiting for a suitable man to take the first step. Monologues, music, songs and dance, all woven around the World War II experiences of Target performers. By the company of players of Target Theatre who play themselves in this musical revue that remembers the sad and the funny of a time when its participants were young.